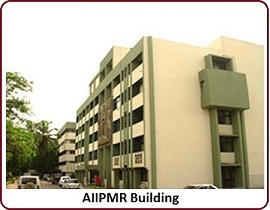 The All India Institute of Physical Medicine and Rehabilitation, established in 1955, is the apex Institute in the field of Physical Medicine Rehabilitation under the Ministry of Health anad Family Welfare, Government of India. Established in November 1955 as a pilot project, with technical expertise and manpower support from the UNITED NATIONS ORGANISATION, with planning and collaboration by an Indian expert late DR M.V. SANT, the institute came under the administrative control of the Ministry of Health and Family Welfare, Govt. of India in 1961. The former Prime Minister, Late Shrimati Indira Gandhi laid the foundation stone for a new five storied building in March, 1959 and it was formally inaugurated by Dr. Karan Singh the then Union Minister of Health and Family Planning in March,1976. Regarding the main Block ( 'A' Block), the foundation stone was laid by Dr. C.P. Thakur, Union Minister of Health and Family Welfare on 29/09/2000 and inaugurated by Dr. A. Ramadoss, Union Minister of Health and Family Welfare on 15/09/2006. The Institute is one of the well equipped Rehabilitation Centers comprising of the Main Block which houses the O.P.D. Complex, 'State of Art ', Operation Theatres and a Post operative Recovery Room , High Tech Prosthetics and Orthotics Fabrication Department including CAD CAM, advanced Physiotherapy Services, Students' Hostel and Guest Rooms. The other two blocks house the Physical Medicine & Rehabilitation Department having a 60 bedded in patient facility, Rehabilitation Therapy departments including Occupational Therapy , Physiotherapy , Speech Therapy, Medical Social Work , Vocational Guidance , Academic Section with Library , Vocational Training Department and the Prosthetic and Orthotic Workshop. Investigation facilities for diagnosis and management of patients are also present in these blocks in the departments of Pathology and Radiology. The Institute is acclaimed globally for its commitment to provide comprehensive medical rehabilitation services to Persons with Locomotor disability from urban & rural areas of the country as well as overseas. It has high standing for its quality of training and research studies which include field studies. The Institute is committed to provide services, impart training and conduct research in the field of Rehabilitation.